One of my favorite monarchs of all time was Baldwin IV of the Latin Kingdom of Jerusalem. He was born in 1161 to King Amalric I of Jerusalem and Queen Agnes of Edessa. While playing as a child it was discovered that he had leprosy and thus could not be expected to live a long or happy life. However, even as a boy, he never let his terrible disease get the better of him. When he was only 13 he became King Baldwin IV of Jerusalem with Raymond of Tripoli as his regent. When he became old enough to rule, he ruled well, but even from day one this diseased young boy was a King to admire. In 1174 the barely teenage monarch led his troops in an attack on the Muslim forces threatening Damascus and Andujar. The following year when the great Muslim warrior Sultan Saladin of Egypt attacked Ascalon King Baldwin IV (better known as Baldwin the Leper) took a mere 500 men to march to the defense of the city. Feeling supremely confident Saladin split his forces to take Ascalon and the supposedly defenseless Holy City of Jerusalem. However, Baldwin summoned the Templars who joined him in defeating the troops at Ascalon and then rushing to overtake Saladin at Ramleh. 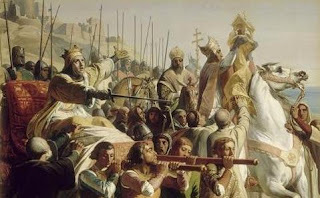 The Christian knights were vastly outnumbered but were devoted to their young monarch who, despite his disease, led from the front and they were encouraged by their faith with the Bishop of Bethlehem on hand with the relic of the True Cross. In a stunning and, to the eyes of many, miraculous battle Baldwin IV and his army totally defeated Saladin's forces. The Sultan himself only escaped because his guard sacrificed their lives to give him time to get away. Saladin tried and tried again but the leperous teenage king bested him at every turn; at Belvoir castle in 1181, before Beirut and at Kerak castle in 1183. In those final campaigns Baldwin's leprosy was so advanced that he was blind, could not walk, was covered in bandages and had to be carried on a litter, yet he still led his troops in the field. King Baldwin IV survived longer than anyone had expected him to but finally died on March 16, 1185 not long after the death of his mother. With the brave warrior-boy-king gone Saladin soon came back and in his next major campaign conquered Jerusalem which prompted the calling of the Third Crusade. I knew of Baldwin but never realized how young he was...amazing story. Reading about his life makes it very hard to complain about anything -hardly more than a boy, eaten up by leprosy and still leading troops into battle to defeat a vastly superior enemy. I don't care how "secular" a person is, it is hard to read his story and not think that some higher power had to be behind him. I AM NOT THOSE MAN ..!! New Face of Free Speech? Denmark Has a New Prince! King James II: Coward or Crusader of Conscience?